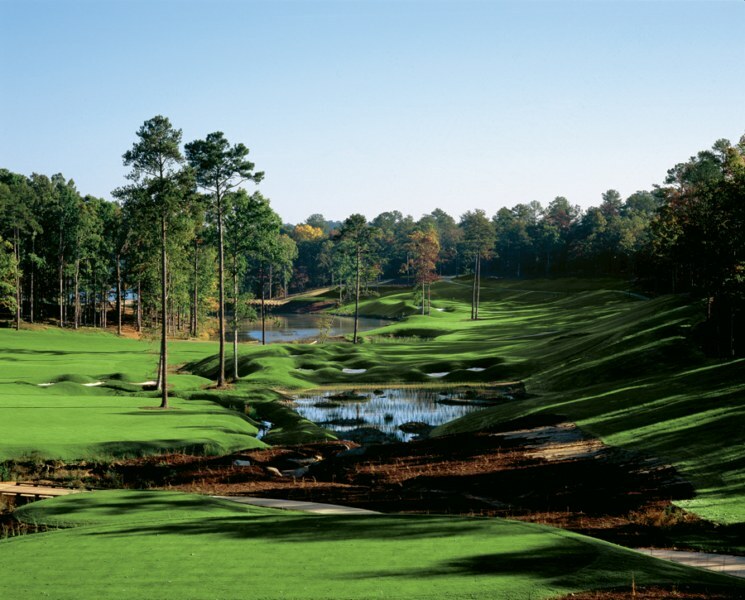 Greensboro, Ga. – When Mercer Reynolds wanted to build the first members-only golf course several years ago at Reynolds Plantation, a resort-style development between Atlanta and Augusta, the developer wondered how he could make his prized property more compelling. Situated on 10,000-plus pristine acres and featuring 80 miles of scenic Lake Oconee shoreline, a Ritz-Carlton Lodge and four golf courses designed by Bob Cupp, Tom Fazio, Rees Jones and Jack Nicklaus, Reynolds Plantation seemed to already have it all. But Reynolds, chairman and chief executive officer of the highly acclaimed master-planned community, felt there was still room to make Reynolds Plantation even better with a new private course. The question was how and with whom. As it turned out, the answer lied with Colorado-based golf course architect Jim Engh. Indeed, Engh, a native of North Dakota who principally worked in the western part of the country, was quickly making a name for himself among true architectural aficionados, earning three consecutive Best New course awards from Golf Digest. The streak started with the 2001 opening of Engh’s Golf Club at Redlands Mesa in Grand Junction, Colo., and was followed up by Tullymore Golf Club in Stanwood, Mich., and the Club at Black Rock in Coeur d’Alene, Idaho. After Black Rock was picked as the country’s Best New Private course, Engh garnered one more high-profile golf award when Golf Digest made him the magazine’s inaugural Architect of the Year. Engh didn’t disappoint the Reynolds Plantation family. Two years after the Creek Club opened at Reynolds Plantation, Engh’s rare Southern footprint is one of the top-selling developments at Reynolds Plantation and a prime example of his bold style that so many golfers have become to love throughout the country. In other words, golf has become relegated in many cases to being a rote exercise with very little creativity in strategy and shot selection. For a man strongly influenced by Ireland, the consistency of American-styled golf leaves little to be desired on the subject of stimulating one’s senses. “When I play in Ireland, which I love the most, my brain is fully turned on and absorbing the experience and evaluating the circumstances of the playing field,” says Engh, who plays to a low single-digit handicap. “My brain is turned on for four straight hours. It never ever stops. It’s so busy absorbing everything. So what does that mean? For Engh, it’s about striving for creative interpretation that ends up giving people things they’ve never seen before, or applying a unique twist on something they have. For example, some of Engh’s familiar touches at The Creek Club he designed at Reynolds Plantation are one-of-a-kind muscle bunkers where the sand is dramatically flanked by mounded sidewalls or uncommon center-line hazards with imposing sidewalls. Another element he often integrates are distinctive multi-tiered greens with player-friendly sidewalls. This allows players to kick errant shots back into play making the course easier for amateurs, while also providing a variety of options for the better players in attacking the hole. Finally, in true Engh fashion, the 18th hole at Creek Club is a thoroughly entertaining par-5 hole that tantalizes the senses with three separate greens complexes. “Reynolds Plantation was a marvelous canvas for him to do his architectural work,” says Reynolds Plantation vice president of golf operations Bob Mauragas, who opened the Creek Club in June 2007. “He took a property that was already well-defined, and what Jim does so well, is he takes a big piece of property and he’s able to create elements that draw your focus to specific areas and creates a real vision and anticipation. At the Club at Black Rock, a highly successful upscale private golf club community owned by Marshall Chesrown, Engh is equally as admired thanks to a brilliant stretch of golf he designed from holes 10-15. Highlighted by black rock cliffs and gorgeous vistas high above Lake Coeur d’Alene, one of the more memorable holes is the par-four 11th hole where you hit a dramatic elevated tee shot over rock outcroppings downhill toward two waterfalls and a green that sits tucked in a bowl. Another signature hole is the 150-yard, par-three 13th which features five waterfalls cascading down a cliff to the left of the putting surface. Chesrown said he had several well-known designers tour his property and some even did some routing plans, but it was clear from the start that Engh was the right guy for the job. Engh enjoys Black Rock and the surrounding area so much he ended up becoming a Black Rock member and bought a nearby property. Engh’s done that and more. In the process, he’s become one of the most sought after golf course designers in the world.